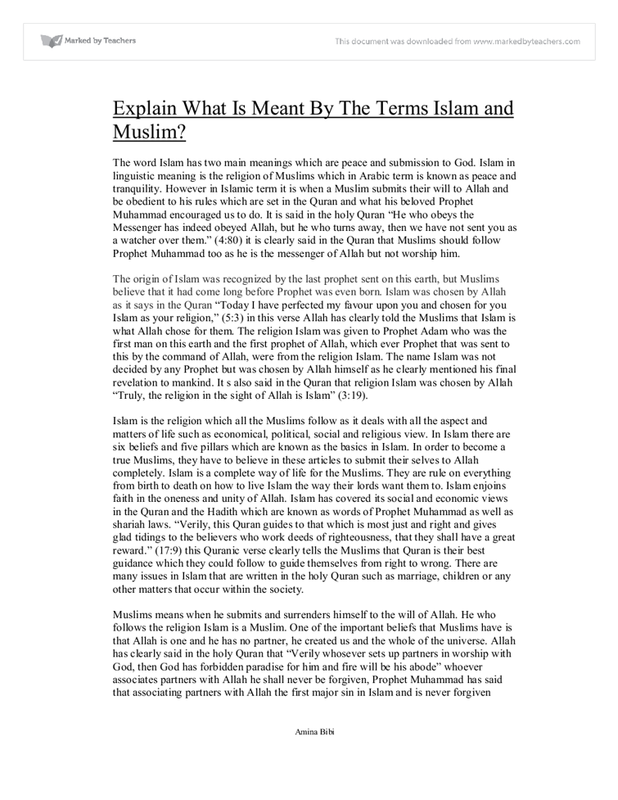 Explain What Is Meant By The Terms Islam and Muslim? The word Islam has two main meanings which are peace and submission to God. Islam in linguistic meaning is the religion of Muslims which in Arabic term is known as peace and tranquility. However in Islamic term it is when a Muslim submits their will to Allah and be obedient to his rules which are set in the Quran and what his beloved Prophet Muhammad encouraged us to do. It is said in the holy Quran “He who obeys the Messenger has indeed obeyed Allah, but he who turns away, then we have not sent you as a watcher over them.” (4:80) it is clearly said in the Quran that Muslims should follow Prophet Muhammad too as he is the messenger of Allah but not worship him. The origin of Islam was recognized by the last prophet sent on this earth, but Muslims believe that it had come long before Prophet was even born. Islam was chosen by Allah as it says in the Quran “Today I have perfected my favour upon you and chosen for you Islam as your religion,” (5:3) in this verse Allah has clearly told the Muslims that Islam is what Allah chose for them. The religion Islam was given to Prophet Adam who was the first man on this earth and the first prophet of Allah, which ever Prophet that was sent to this by the command of Allah, were from the religion Islam. The name Islam was not decided by any Prophet but was chosen by Allah himself as he clearly mentioned his final revelation to mankind. It s also said in the Quran that religion Islam was chosen by Allah “Truly, the religion in the sight of Allah is Islam” (3:19). Islam is the religion which all the Muslims follow as it deals with all the aspect and matters of life such as economical, political, social and religious view. In Islam there are six beliefs and five pillars which are known as the basics in Islam. In order to become a true Muslims, they have to believe in these articles to submit their selves to Allah completely. Islam is a complete way of life for the Muslims. They are rule on everything from birth to death on how to live Islam the way their lords want them to. Islam enjoins faith in the oneness and unity of Allah. 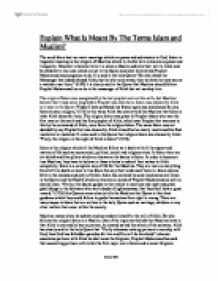 Islam has covered its social and economic views in the Quran and the Hadith which are known as words of Prophet Muhammad as well as shariah laws. “Verily, this Quran guides to that which is most just and right and gives glad tidings to the believers who work deeds of righteousness, that they shall have a great reward.” (17:9) this Quranic verse clearly tells the Muslims that Quran is their best guidance which they could follow to guide themselves from right to wrong. There are many issues in Islam that are written in the holy Quran such as marriage, children or any other matters that occur within the society. Muslims means when he submits and surrenders himself to the will of Allah. He who follows the religion Islam is a Muslim. One of the important beliefs that Muslims have is that Allah is one and he has no partner, he created us and the whole of the universe. Allah has clearly said in the holy Quran that “Verily whosever sets up partners in worship with God, then God has forbidden paradise for him and fire will be his abode” whoever associates partners with Allah he shall never be forgiven, Prophet Muhammad has said that associating partners with Allah the first major sin in Islam and is never forgiven “Whoever died while supplicating another deity besides Allah, will enter the Fire.” (Narrated by Bukhari). Muslims believe that there are five pillars of Islam that they should act upon, if one does not believe in one of them for example shahadah is not classed as a true Muslim in Islam. Whoever is a Muslim have to bear witness that there is no God but Allah and Muhammad is the Messenger of Allah”. There are also six belief that Muslims have to believe in, which is believe in one God (Allah) and ascribing no partners with him, he who joins partners with Allah is never forgiven and fire will be his abode The Messenger of Allah has said: “Indeed, Allaah has forbidden upon Hell the person who says: ‘There is none worthy of worship except Allaah,’ seeking thereby the Face of Allah.”(Al-Bukhaaree), believing in Prophets that were sent down on this earth by Allah to preach his words and to be a good role model to them, believing in Angels that they are created by Allah to worship him and the different task that they carry out, they are made of light, believing in the last day which all the Muslims will be judged by Allah, believing in his books and scriptures which were sent to the Prophets, Quran is the only book sent by Allah to Prophet Muhammad has its original meaning and lastly whatever good and bad happens is written in their destiny. Every Muslims heart should be pure and clean. There are also many different Prophets that Allah sent down to preach his message of Islam. They were sent to many different places and people which is clearly written in the Quran And for every nation is a messenger. So when their messenger comes, it will be judged between them in justice, and they will not be wronged”. They all taught them one message which was to worship him only as he is the only God worthy of worship. Allah has told the Muslims in the Quran that same message was revealed to other Prophet that same message that was revealed to Prophet Muhammad, “Indeed, We have revealed to you, [O Muhammad], as we revealed to Noah and the prophets after him. And we revealed to Abraham, Ishmael, Isaac, Jacob, the Descendants, Jesus, Job, Jonah, Aaron, and Solomon, and to David we gave the book [of Psalms]. And [We sent] messengers about whom we have related [their stories] to you before and messengers about whom we have not related to you. And Allah spoke to Moses with [direct] speech. [We sent] messengers as bringers of good tidings and warners so that mankind will have no argument against Allah after the messengers. And ever is Allah Exalted in Might and Wise. (4:163-165). There are three different branches of faiths that Muslims in Islam have; these are Muslims, Mu’min and Muhsin. A Muslims is who acts upon all the pillars of Islam however may disagree on some of the commands of Allah and follows the obvious rules in Islam. Mu’min is who believes in Allah and avoid sin. Lastly the highest and best faith is Muhsin, he who does everything for the love of Allah and to gain his pleasure only. There are also two levels of Muhsin, first one is Worshipping Allah as if they can see him and the second is being aware that Allah sees all of their deeds and acts. Muslims purpose of living is only to worship Allah, if he is living his life however has chosen the wrong path then he is useless, Allah has said in the Quran “And I did not create the Jinn and mankind except to worship me” (51:56). All Muslims around the world are united. Allah has made it clear for muslims in the Qur'an that unity of the Muslim Ummah is very important as it is said in the Quran "And hold firmly to the rope (His covenant or the Qur'an) of Allah all together and do not become divided." (3:103). There are many events that unite all the muslim ummah such as clebrating Eid, giving charity to the poor and fasting in the month of Ramadan. Prophet also also mentioned that muslims ummah should be supportive of eachother when he says “Believers are like the parts of a building, each one supporting the other.” (Sahih Al-Bukhari). The even of Hajj is one of the important occasion where all mulims unite and share the sense of brotherhood while submitting theirselves to the will of Allah completely. To Prphet Muhammad unity of muslims was very important to him, he has said in one hadith to those who try to break his ummah “He who rebels against my Ummah while they are united, strike his neck with the sword whoever he may be.”(Muslim). All Muslims in Islam are slaves of Allah regardless of their race, social status, colour or ethnicity, Allah view them as all equal; the only thing that differs is their deeds and actions. They have to submit their live to the will of Allah in order to gain paradise in the hereafter. Allah, the almighty has said in the Quran “Whosoever surrenders himself to Allah while doing good, he will have their reward with his Lord, there will be no fear over them and nor shall they grieve,” (2:112). This verse clearly tells the Muslims that when they submit their selves to the will of Allah, he will be rewarded. Indeed their living and dying should only be for Allah. This student written piece of work is one of many that can be found in our AS and A Level Islam section. The oneness of God cannot be three different elements. Muslim's believe that the birth of Jesus was a miracle. He was born of a virgin Maryam, without a father, by Allah's command2 .Allah as mentioned is the most powerful and nothing is impossible for his. Sufism is the heart of Islam because Sufis themselves surrender internally as well as externally to the will of God, as it not only is one of their core beliefs but also they make the extra effort to surrender to the will of God, instead of mainstream Muslims who limit themselves to following the legalistic side of the religion. There are seven sacraments: Baptism, Confirmation, Holy Eucharist, Penance, Anointing of the Sick, Holy Orders, and Matrimony. The three important sacraments are. Penance to the priest the priest absolves the sins that you tall him. Last rites. Last rites are also called extreme unction and sacrament of the sick. This is a place of tranquillity and peace. There are many levels of Jannah which the believers will inhabit according to their good deeds, and the highest level, close to the throne of Allah, is known as "Firdaws". Jannah consists of many gardens underneath which rivers flow, there are fruits of every kind, and various drinks. They said: "Yes." He said: "This, then, is the deficiency in her intelligence. Isn't it true that when she is in her menses, she leaves off prayers and fasting?" They said: "Yes." He said: "This is the deficiency in her religion."